Which is the best Bermuda grass seed for lawns? BEFORE you seed… read this. The problem is that most Bermuda lawns are sod and sod is a hybrid, meaning that the seeds are sterile. The is no way to buy YOUR matching lawn seed. If you buy CHEAP common Bermuda seed, it will not blend into your current lawn and look ugly. So, first we must understand the difference between cheap COMMON Bermuda grass seed, and the higher end FINE Bermuda seed. 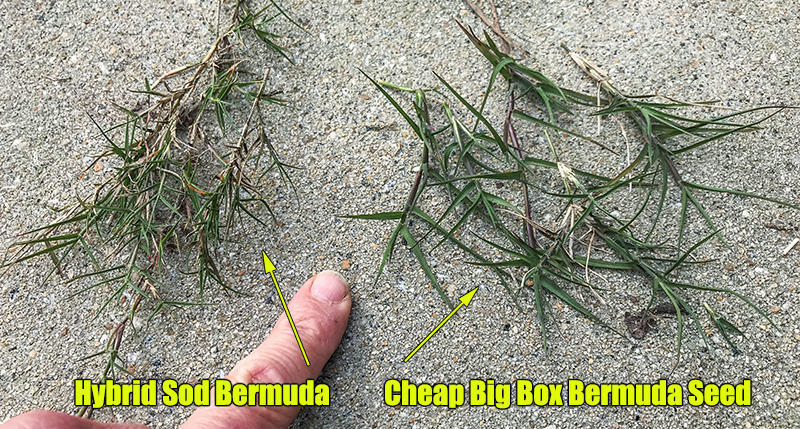 If you go to the “big box stores” you’ll find cheap COMMON Bermuda seed. This seed produces Bermuda grass that has wider blades and larger overall plant size. It also grows TALLER than the more costly seed types. See below. #1 DO NOT seed when soil temps are below 65. Unlike fescue lawns, Bermuda seed likes the warm weather. #2 Don’t skimp on the seed cost. I’d rather see you put down less seed and spend more on a quality seed. #3 Don’t just thrown it on the ground. If you are SERIOUS about planting Bermuda grass, it needs to be covered with about 1/2 of soil. So till up the area to seed or cover with quality soil. Keep in mind that heavy rains may wash away top dress soil but seed that is tilled in, will not move. #4 Don’t spare the water. Water daily or twice daily as needed. Seeds need moisture to germinate. Once they germinate they need water to survive. They have no roots so they rely on the top 1″ of soil unlike established Bermuda lawns. #5 Don’t fertilize heavy. Spray with Super Juice every 2-3 weeks. New seed just needs a small amount of nutrients. 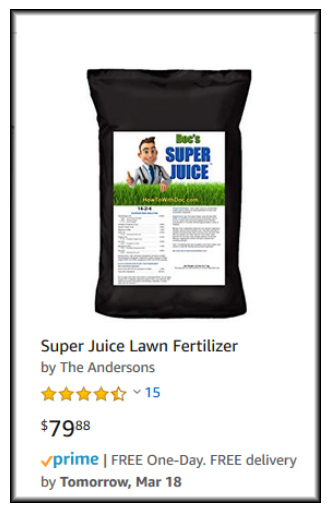 Once the grass has been cut once, then you can put down PGF fertilizer. #6 DO NOT plant seed on lawns that have had pre-emergent placed down within 12 weeks min. PEs stop seeds from growing. ← Click to see current pricing. Black Jack is SAID to be more shade tolerant, but we have not tested that. Good quality seed with finer texture. Hybrid quality grass from seed. Princess is a very dense, dark green, fine textured synthetic hybrid bermuda grass that can be established from seed. About $30 – $45 a pound. This Bermuda turf grass seed is a synthetic variety produced by the inter-crossing of five parental plants that were selected in 1990 from a cold hardy study, based on high turf quality – making it the most cold tolerant Bermuda grass. Known as one of the most persistent and aggressive grasses grown it is very hard to kill Bermuda grass after establishment. The down side to Bermuda grass can be the aggressive quality that also makes it so popular. Flower beds or other adjacent areas can be over-run if not kept in check by constant edging or applications of organic herbicides . This is one of the grasses that can “return from the dead” if not completely killed the first time due to its extensive root system. Just digging it up without getting rid of the roots will not solve the problem. Repeated tilling and the removal of roots is usually required to kill Bermuda grass. Blade texture can range from slightly coarse to very fine depending upon the variety. This grass prefers well draining soils whether acidic or alkaline and tolerates soils from sandy to clay. It is adapted along coastal areas into the interior of the country. The wear ability factor is high and depending upon the cultivars Bermuda grass can repair moderately well.